Manual Hospital Beds are medical beds that use hand cranks to raise the entire bed level, as well as the head and foot sections of the bed. This results in optimal comfort for the patient. Manual hospital beds are just as versatile as full and semi-electric beds, but lack the risk of motor failure and maintenance. Sturdy, reliable and comfortable, these medical beds are a cost-effective long-term care option. Drive Medical: As one of the fastest growing global distributors of durable medical equipment, Drive Medical offers a straightforward, fail-proof manual hospital bed that's simultaneously comfortable and sturdy. Invacare: Invacare manufactures quite a few long-term care products, including manual hospital beds. 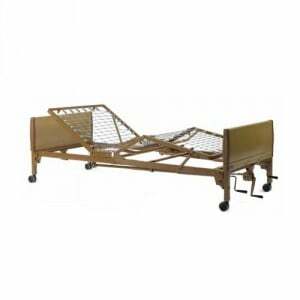 If you're looking for an economical hospital bed bundle, take a look at Invacare's selection. 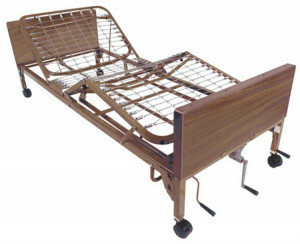 MJM Manual Hospital Beds: MJM is another manufacturer of manual hospital beds, including a model that is equipped with a PVC gurney and hard shell drain pan for ease of use. Reinforced headspring for maximum bed strength and support. Easy release motor mounts for quick motor removal. Durable casters for increased mobility and secure locking. Reinforced corner plates to prevent bending. The advantages and disadvantages offered by manual hospital beds and other hospital beds can be viewed at Hospital Bed Comparisons.